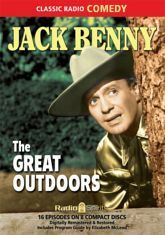 Jack heads off for sixteen rootin'-tootin' outdoor escapades, along with Mary Livingstone, Phil Harris, Bob Crosby, Eddie "Rochester" Anderson, Kenny Baker, Dennis Day, and Don Wilson. Go with the whole gang as they venture into the heart of the storm, head out on the high seas, challenge themselves with a twenty mile march�or maybe just grab a few holes of golf. Includes a Program Guide by radio historian Elizabeth McLeod.